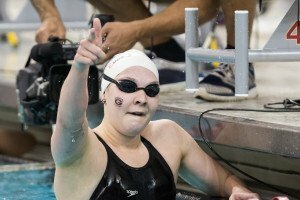 Olivia Smoliga is on fire for the Georgia Bulldogs, swimming better than we’ve seen her swim in a full year. The junior rolled to a career-best 50.80 repeat win in the 100 backstroke, passing up top-seeded Kira Toussaint of Tennessee. Smoliga now sits #2 in the nation, behind only Courtney Bartholomew of Virginia. In an interesting twist, Bartholomew swam just minutes later at the ACC Championships in North Carolina, going 50.74. Toussaint, the Dutch star who transferred in from Florida Gulf Coast this year, went 51.14 for the Vols, taking second but gaining three tenths from her prelims swim. The battle is particularly heated at the top here because Smoliga’s Bulldogs are attempting a comeback on Toussaint’s Vols, who lead the SEC points right now. Kentucky’s Danielle Galyer went 51.78 for third, moving up and past Georgia’s Kylie Stewart (51.91) from their seeds. Missouri racked up some points with a pair of A finalists in last summer’s long course breakout star Hannah Stevens (52.23) and Nadine Laemmler (52.32) and Auburn also added two finishers in 7th (Sarah Reynolds) and 8th (Jillian Vitarius).